At our household, we have five beds for planting vegetables. My wife manages four of them, and I lovingly cultivate and nourish the other one (which is pictured below). 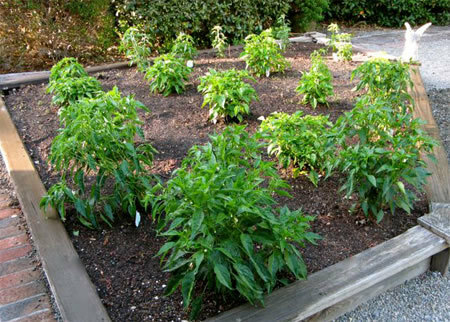 Usually I grow several chili pepper plants — Thai or Habanero — along with tomatoes and other vegetables. But not this year. This year, I've gone ALL CHILI PEPPER 100% of the way. That's because I ran out of chilis last December. My Habaneros were SO GOOD that I had to eat some every day. (I freeze them after I harvest them.) They make the meal! Their active ingredient, capsaicin (methyl vanillyl nonenamide), does wonderful things to my brain (endorphins getting released) and inspires my creativity! My chilis make ideas drip off my brow like beads of sweat. No running out this year: I put in 24 plants in all. In the foreground are 4 De Arbols. At rear are 6 Thais and 6 Miuras, and in the middle are my precious 8 Habaneros (capable of packing a punch of up to 300,000 Scoville units!). Lucky me and my fortunate friends. Lots of inspiration ahead! Perhaps that angel overlooking your garden functions like a muse that brings good things to your mind -- through the appreciation you have for what grows in her presence. That happened to me. I was once cutting up a jalepeno instead of using the usual powdered cayenne. But this pepper just smelled like a regular green pepper, not hot at all! So I popped a slice into my mouth. I was pretty wrong. After running for the milk, I started plastering post-its full of ideas all over the kitchen. Thanks for the tip on freezing the peppers, Roger. I love growing peppers because they yield so much fruit but the problem is that they do it over a couple of months. How many salivary glands can a guy wipe out in a summer? Now, I am going to plant more than the two or three because I have something I can do with them to "keep the creativity" and the "inner fire" going year round. I live in Arizona, and have started 2 arbol chili's from seed. They are several months old about 18 inches tall but have not flowered or set fruit. How to do get them to produce chili's?